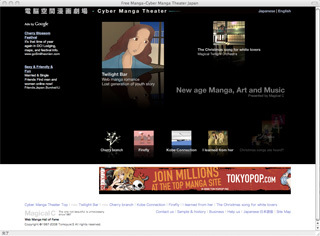 Read Manga Online for Free "Manga Theater" English version is released. Magical C released "Manga Theater" English version. Now, young person Read Manga Online for Free romance "Twilight Bar", Read Manga Online for Free novel "cherry branch", Read Manga Online for Free "Kobe connection", digital picture book "Firefly", Read Manga Online for Free for the student "I learned from her", and the original music by the orchestra "The Heart Of A Broken Christmas Song" is started. It opens it to the public while possible to be reproduced by selecting the text part in Flash contents. And, the technique of improving the quality in addition has been taken by the ordinary user"s feedback. establishment in 1996. Recently, Comic attracts attention in the world. This time, we are paying attention how much is popularity obtained. We analyze this result in detail. And, the release of a French version, an Italian version, a German version, a Chinese version, and a Korean version, etc. is planned.